The Nominations and Elections Committee is responsible for the development of the annual election slates, and for supervising the election process. The Committee ensures that elections are conducted within both the requirements of our IASWG Bylaws and the spirit and values which underlie our organization. The chair of the Nominations and Election Committee is Kyle McGee ([email protected]). Committee members include: Maria Gandarilla, Sam Benbow, Alexis Howard, Joyce Webster, Mark Doel, and Jorune Vysniauskyte-Rimkiene. In 2019, the Nominations and Elections Committee is seeking nominations of IASWG members interested in serving our organization by becoming members of the Board of Directors. This year we will be seeking to fill the following roles: three “member at large” positions (2 yr term) for those whose terms of service have ended. These are wonderful opportunities for IASWG group workers to become more involved with the Association at the international level and to contribute to the development and growth of the organization as we continue to promote social group work practice and education. The deadline for nominations is August 5th, 2019. Solid track record of responsibility taken at the chapter, community, and/or professional organizational levels. In addition to the above leadership qualities, the Nominations and Elections Committee also seeks candidates who might bring a range of diversity factors to the Board (for example, ethnicity, gender, age, geographical representation), as well as seeking a balance between practitioners and those whose group work engagement is primarily at the academic and/or scholarly level. Attend meetings of those committees at the meetings of the board (usually at the symposium and one fall meeting), and correspond with committee members during the year to pursue the work of the committees. 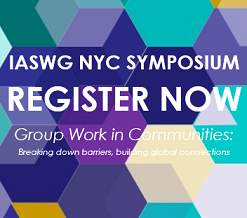 IASWG reimburses Board members for travel expenses to the annual fall Board meeting held each year in NYC, but costs to attend the annual spring Board meeting held each year at the IASWG Symposium site are not reimbursed.